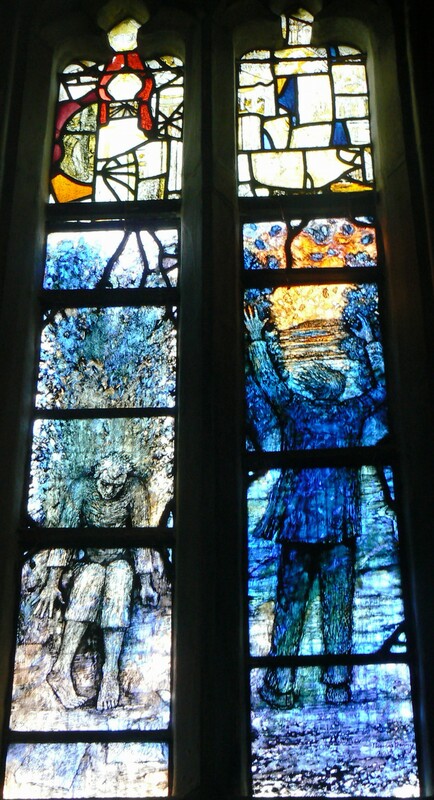 In Gloucester Cathedral there is a new stained glass window created by Tom Denny, which is a memorial to the Gloucestershire poet, Ivor Gurney. Like Will Harvey, whom I have written about before, he was a pupil and chorister at the Cathedral school before joining the Gloucestershire Regiment to serve in the First World War. Indeed, they were great friends. Gurney was a talented musician firstly, but in the thick of war, poetry became his creative outlet. Like Will Harvey he survived the war but was drastically changed by it. So much so that his fragile mental health was totally destroyed, and he spent many years in a mental asylum where he eventually died before he was 50. Gurney is buried at Twigworth, where his gravestone commemorates him as ‘poet composer of the Severn and Somme’. 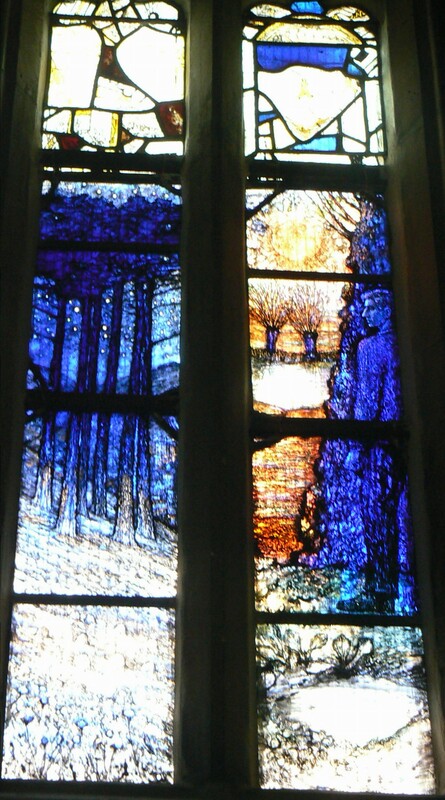 Gurney’s poetry is beautiful and reflects his love for the Cotswolds, the countryside and the beauty of nature. I’d like to share 2 of them with you that touch me deeply for different reasons. Firstly, To His Love which is a poem thought to be written by Ivor Gurney when he thought his friend Will Harvey had been killed. Rend and embronze the air. With sombre sunbeams mixed of Autumn rare. Arms, and to save England from her own. 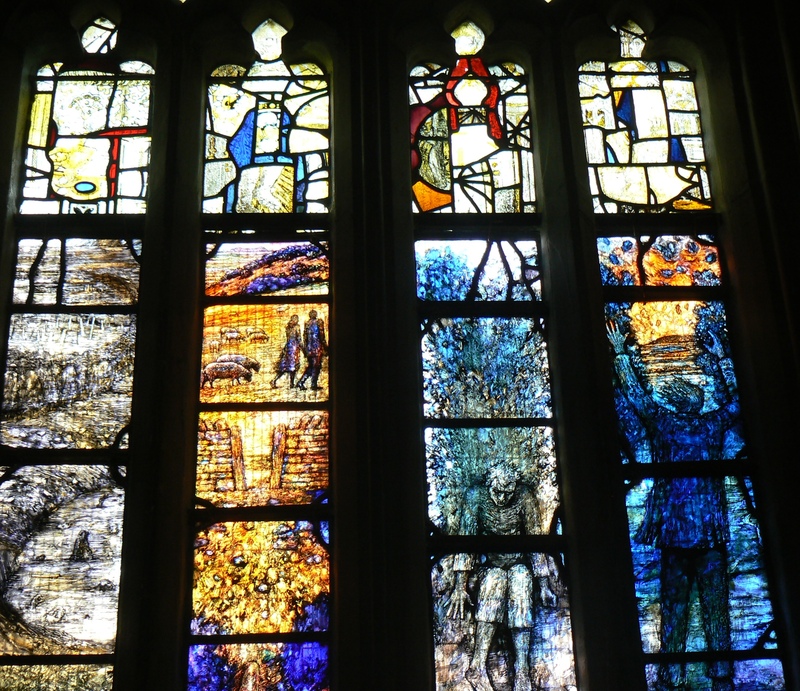 There are many learned websites with information about Ivor Gurney, but my wish today is simply to share the beauty and poignancy of the new window and explain a little of its background. 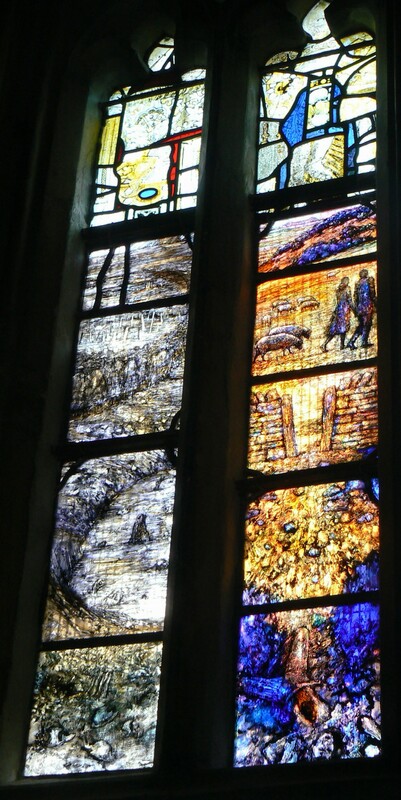 There are 8 lights or panes overall and each reflects something from the life and writing of Ivor Gurney. 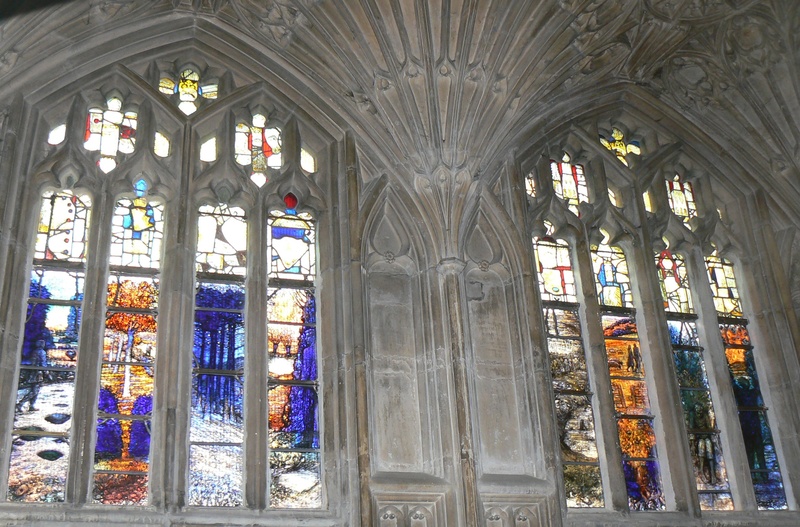 The notes are a precis of those that appear in the Cathedral by the window. Light 1 ~ Glimmering Dusk ~ a figure walks at dusk in a Vale landscape. there are dark pools of rain on the white road and May Hill can be seen in the distance. 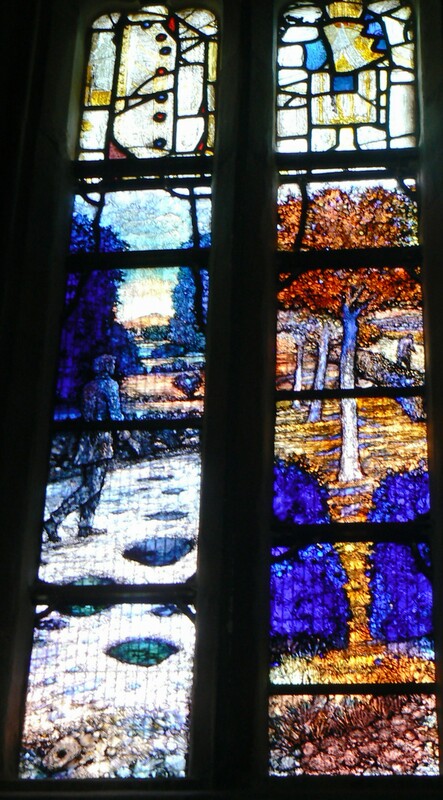 Light 2 ~ The Stone Breaker ~ In Flanders a chance encounter with some road menders reminds Gurney of a much earlier meeting (“Oh years ago and near forgot”), in the fresh beauty of a summer’s early morning, in a landscape of Vale orchards. Light 3 ~ Brimscombe ~ Gurney remembers a night-time walk through the fir trees of the steep-sided Brimscombe valley near Stroud. The “pure clemency” of the moment enables him to forget the “blackness and pain” of France. Light 4 ~ Severn Meadows ~This was written in March 1917 at Caulaincourt. As the sun sets over Severn meadows, a figure, in the shadow of a willow, looks back at the river and the willows. Light 5 ~ Pain ~ Gurney recalls the grey-white Somme battlefield. “Pain, pain continual; pain unending;…. Careless at last of cruellest Fate-sending. Dying in shell-holes both, slain by the mud. The amazed heart cries out to God. Light 6 ~ To His Love ~ Probably drafted on the Somme battlefield, Gurney reacts to the news (false as it turns out) that his great friend, the poet Will Harvey, is presumed killed. A couple walk on the Cotswold hills as their dead friend lies among the violets. Light 7 ~ To God ~ In the intense suffering from mental illness, surely aggravated by his experiences on the battlefields, Gurney cries out for death, “I am praying for death, death, death”. Light 8 ~ Song and Pain ~ A more optimistic end to the window as a figure emerges from an understanding of pain to enter “The House of Joy”. 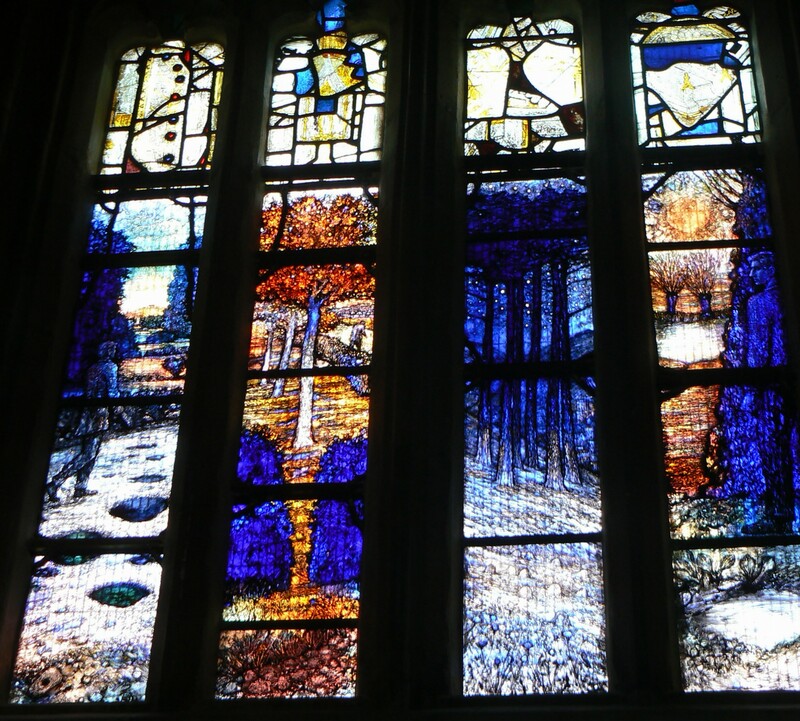 As I stood and gazed at these incredibly beautiful but harrowing windows, there were people around me moved to tears by what Gurney had seen and suffered. Tom Denny is a wonderful artist. He has captured and honoured Gurney’s genius, his love of Gloucestershire, and his suffering in that dreadful war and in his mental distress.